The BeoVision 6 was B&O’s first attempt at a television based around LCD technology. This gave the designers the opportunity to produce a set with a really slim cabinet, a long term design goal for B&O’s television designers. Text copyright © Beocentral. Unauthorised reproduction prohibited. Technology for B&O’s cathode ray tube (CRT) televisions had (with only a few exceptions) come from Philips. Although currently in decline, Philips used to be the leader in this field. Throughout the first five generations of tube since the introduction of colour in Europe, Philips had generally provided the best product. Therefore Philips tubes were used by all the quality television manufacturers except Sony, who made their own. In the change to LCD, B&O turned to Samsung, a Korean firm with a less impressive past. Text copyright © Beocentral. Unauthorised reproduction prohibited. In the UK, Samsung products had traditionally been low-end, placed between the “own brand” ranges marketed by discount warehouses and the entry level of the more familiar maker’s product lines. Small colour TV sets, basic video recorders and indifferent music centres had been their staple fare, and so when it was revealed that their LCD panel would be the key component of a new Beovision quite a stir was caused. Text copyright © Beocentral. Unauthorised reproduction prohibited. To describe the BeoVision 6 as a “Samsung TV” would be unfair though. B&O added a lot of their own content, designing and producing the signal processing circuitry, system control, audio stages and power supply of the new set, along with all the cabinet work and the stand. There was more “B&O” in the BeoVision 6 than there was in the MX 2000 for example. Text copyright © Beocentral. Unauthorised reproduction prohibited. The specification of the BeoVision 6 was very similar to that of the previous MX 4000 series of sets. Similar facilities were provided, along with similar connections. In the case of the MX 4000, if one wanted Masterlink for multi-room operation then a different model, the MX 4002, had to be ordered. With the BeoVision 6, all sets were fitted with a Masterlink socket but an optional extra panel had to be fitted inside the set if it was to be used. Text copyright © Beocentral. Unauthorised reproduction prohibited. Just like the smaller MX models, loudspeakers were limited to two full-range units, though the BeoVision 6 cabinet did not allow for the “log-line” loading tubes so a slim “bass reflex” system was constructed inside the front panel instead. Text copyright © Beocentral. Unauthorised reproduction prohibited. The BeoVision 6 was launched mid-year and so did not feature in the then-current main catalogue. As a temporary measure, a small extra brochure was issued with attractive pictures and brief functional details. Text copyright © Beocentral. Unauthorised reproduction prohibited. 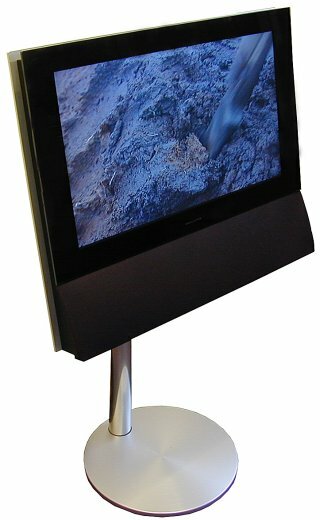 As with all Beovision sets, a range of matching stands was produced. The motorised stands had an interesting feature, for they allowed the set to be both rotated and adjusted in angle in the vertical plane. The latter function was required to compensate for the somewhat limited viewing angles over which the LCD could produce a viewable picture. Text copyright © Beocentral. Unauthorised reproduction prohibited. Although the BeoVision 6 nominally replaced the smaller MX models in the range, it was not a match in cost terms. At roughly twice the price for a set of identical functionality and similar size it was difficult to cite the BeoVision 6 as good value for money. The extra cost could not be justified in picture quality terms either, for even though it was considered as one of the better performing LCD sets the results were still pretty poor when compared to any other colour Beovision with a similar sized screen. Text copyright © Beocentral. Unauthorised reproduction prohibited. The BeoVision 6 range was later expanded with new models that featured larger screens and extra built-in sources. Text copyright © Beocentral. Unauthorised reproduction prohibited.